5 Bacon Appetizers to Include on your Holiday Bacon Bar! This is a sponsored post written by me on behalf of Smithfield. Thank you for supporting the brands I love who make this blog possible! Five amazing bacon appetizers to make your holiday Bacon Bar a surefire hit! My love of bacon is very well documented. I’ve posted so many bacon recipes here at Blackberry Babe, that one of my lifelong girlfriends has started calling me Bacon Babe! No joke. The holidays are the perfect time to up the stakes on your bacon game. My friends at Smithfield recently introduced to the idea of a “Bacon Bar” for holiday parties, and I absolutely love it! A beautiful holiday table full of delicious bacon appetizers and treats is the PERFECT way to wow your guests this holiday season. Whether you go simple or cook up some elaborate bacon appetizers, your friends definitely won’t forget the year that you had a bacon bar at your holiday party! Psssttttt…. because I love bacon so much, I’ve teamed up with my friends at Smithfield to give a lucky reader “Bacon For a Year!” Scroll to the bottom of this post to enter! An appetizer everyone will be fighting over! 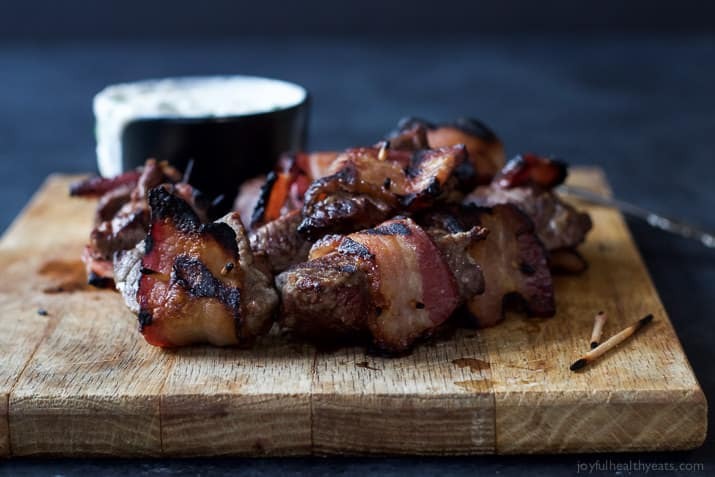 Tender Bacon Wrapped Tenderloin Bites charred on the grill and served with a homemade creamy horseradish sauce! OMG! Get the recipe here. Bacon is candied in brown sugar, then tops ooey gooey baked brie. The most decadent appetizer you’ll ever eat! Get the recipe here. Sweet potatoes cut into fries, seasoned with salt, pepper, and smoked paprika then wrapped in uncured applewood smoked bacon and baked to perfection! Get the recipe here. I mean, seriously… How in the heck can you go wrong with BEER, BACON and CHEESE?! It’s not possible. This recipe is so crazy easy it’s elementary. Get the recipe here. Bacon is good all by itself, right? I love the idea of including a few fun appetizers on your Bacon Bar, but you should also just include bacon by itself, in all of it’s glory! Lucky for us, Smithfield Bacon has 10 delicious varieties that you can cook up and serve to your guests! I love the Peppered Brown Sugar Bacon. Serve your favorite varieties with an assortment of jams and biscuits. Easy, peasy! And, you can find printables, recipes and decor ideas on Smithfield’s Bacon Bar site! I hope that your holiday preparations are going well, and that you consider adding a festive Bacon Bar to your holiday party plans! To help your bacon acquisition activities, I am giving away a year of Smithfield Bacon to one lucky reader! Visit the Smithfield Bacon Bar site to find your favorite recipe, then leave a comment here to enter. good luck! You are so welcome! It is fabulous and so easy! The bacon twists look good, but craving bacon wrapped water chestnuts. My favorite is the recipe for bacon cheddar biscuits. I especially like that they are drop biscuits. which are so much easier to make than rolled biscuits. I would like to try the Sea Salt Caramel recipe. I’d love to try the Caramelized Bourbon Bacon! Yum! I want to try the Bacon Jam. The crispy bacon twists look amazing! I would love to try the Carmelized Bourbon Bacon. The Twice Baked Sweet Potatoes with Bacon sounds amazing! I think my favorite recipe is Caramelized Bourbon Bacon, although they all looks so incredibly amazing! Bacon Cheddar Biscuits looks amazing. They all sound delicious, Bacon is my absolute favorite! Caramelized Bourbon Bacon is on my list to make! I would love to try the bacon twists with Gouda & apricot preserves! Sounds delish! I definitely want some of that Caramelized Bourbon Bacon. that sounds amazing. I could see crumbling that up & putting it on baked potatoes or burgers. I want to try the Crispy Bacon Twists with Gouda and Apricot Preserves! OMG! It sounds so good!!! I would have to choose the Bacon wrapped sweet potato fries! recipe from their website. Bacon is my all time favorite food. This is such a great prize! Sea salt caramel sounds wonderful–and I love the idea of a bacon bar! Those bacon cheddar biscuits look wonderful! My favorite recipe is the Cherry Bacon Jam with Thyme and Cloves! Thanks for the chance at this! The Bacon Jam sounds yummy. The Caramelized Bourbon Bacon sounds so good! The Caramelized Bourbon Bacon recipe looks so easy to do and I’m sure all the guys in my family would love trying a few strips. Those bacon twists look incredible! I LOVE BACON!! Who doesn’t? Bacon-Pork Chops with BBQ Glaze – looks wonderful. I like the Bacon Twists. Can’t go wrong with anything bacon! The sea salt caramel bacon recipe looks tasty…and easy! Oh my…Bacon wrapped sweet potato fries! The Cherry Bacon Jam with Thyme and Cloves looks fantastic…smeared on a biscuit! This is absolute heaven for bacon lovers! Bacon is one of the best foods on the planet! I love that you added a bacon bar. It’s simple, easy, and lets face…you just can’t beat a slice of bacon! The Crispy Bacon Twists with Gouda and Apricot Preserves sound amazing. I love the idea of the apricot preserves. My favorite recipe to try would be the Cinnamon Toast Bacon Pancakes. These look delicious and easy. My kind of treat! Love all these bacon ideas! They’ll be great for the holidays and the Super Bowl! 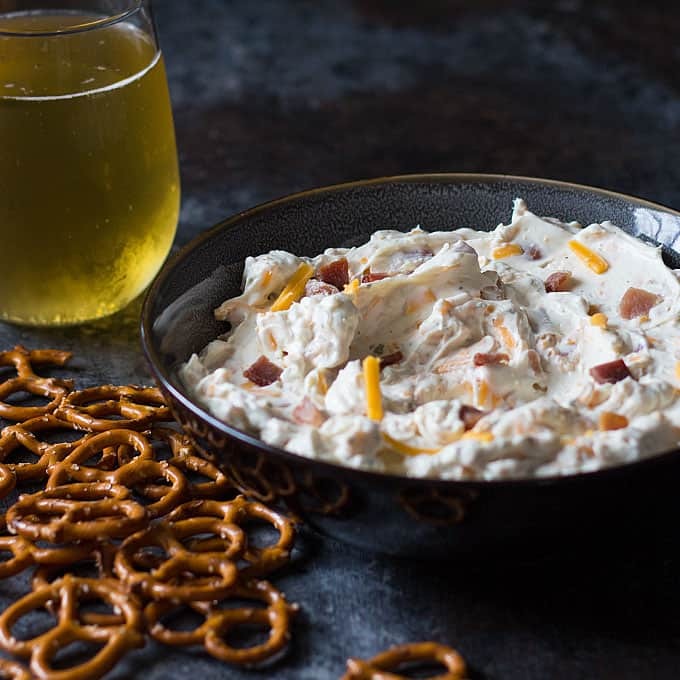 That Bacon Beer cheese dip is calling my name! I have to make this! Thomas and I would love it!